Hi Everyone, New to the forum but have been reading here for quite a while. Anyway, I have these boards I pulled from something in the past; most likely some sort of 800-900MHz Motorola repeater. They seem interesting enough to make a post about them to try and figure out what they are and see if they would be of any use in amateur radio. The white ceramic board is definitely in the microwave region. 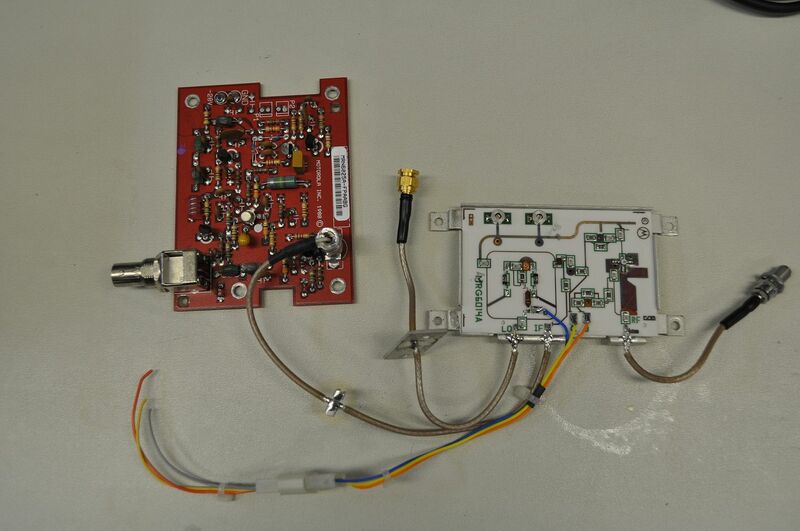 I'd imagine between 800-1.2GHz and appears to be some sort of mixer and or pre-amplifier. the part number on the board is MRG6014A. It has a "LO" (Local Oscillator?) port with a male SMA connector. An "IF" port that connects to the other board, (which I guess would be an IF board.) The Blue, Yellow and Orange wires are labeled D, C and B respectively and an "RF" port ending at a female BNC. 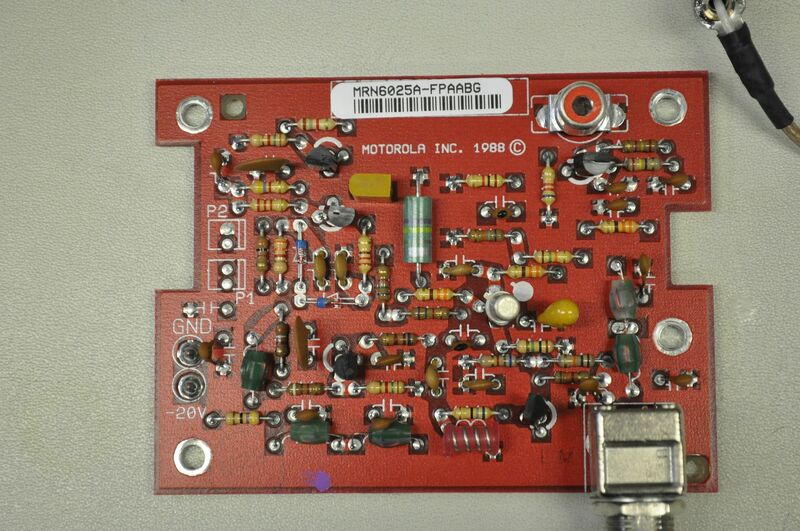 The other red masked PCB which I believe to be an IF, is labeled part number MRN6025A-FPAABG. The "IF" of the other board connects to the female RCA plug of this board. The input is a BNC jack located across from the RCA. 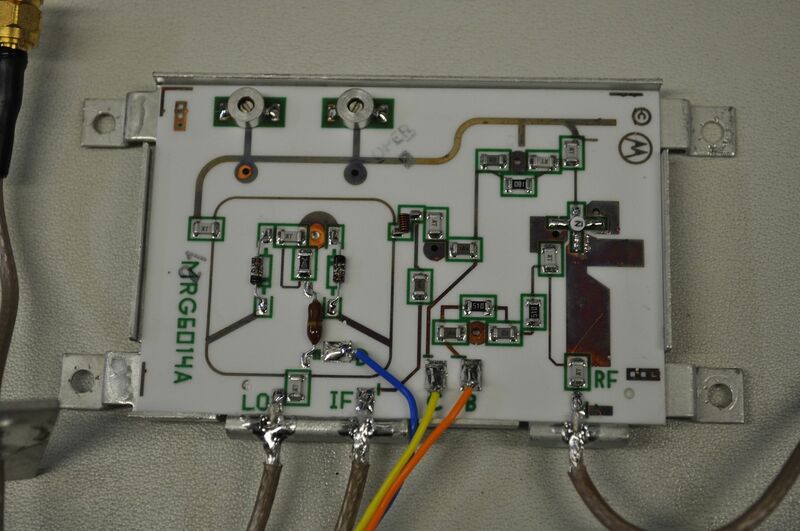 The board is powered with a -20VDC power supply. If anyone can identify these boards or has any information on testing, that would be greatly appreciated! The ceramic board appears to be a mixer, with Lo, RF and IF ports, as a normal complement to a mixer's function.